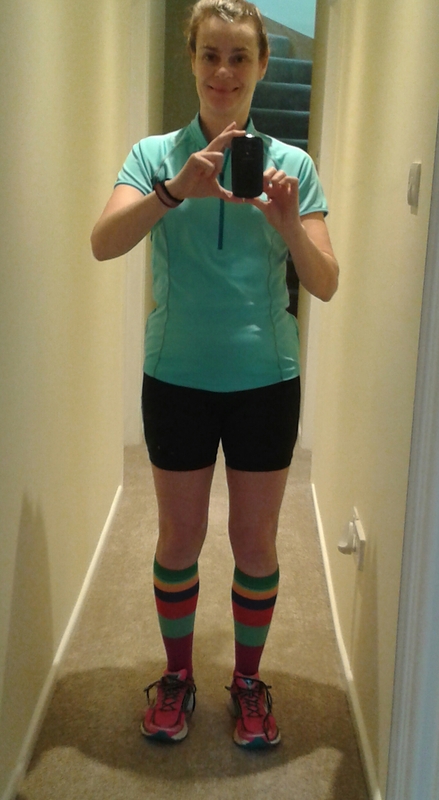 After starting a long and dull race report (you know the sort – just look at some of my early reports!) I decided I was even boring myself and I’d better start again. Here goes. 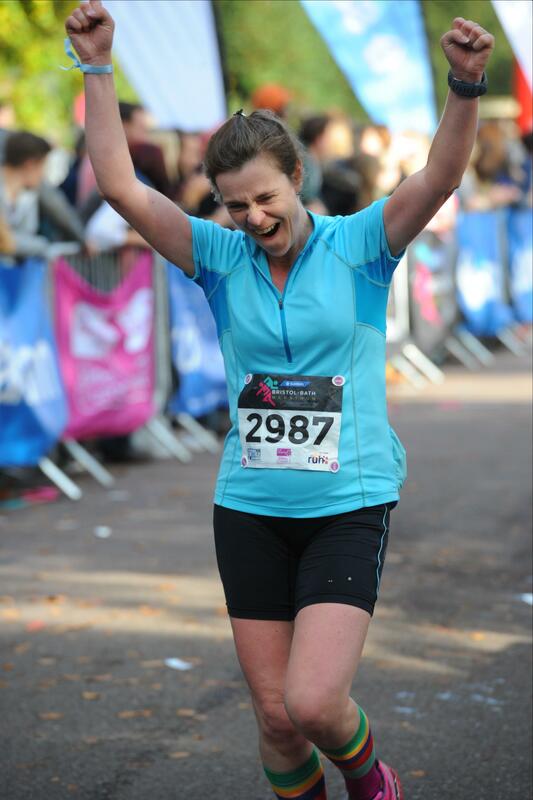 The amazing thing about the Bristol to Bath marathon wasn’t the start, or the finish, or the support between the two. It wasn’t the number of Portaloos or water stations, or the weather or even the medal. It was the sum of all these things, and a little something extra – how I felt on the day. As I’ve already written, I loved every minute of this race. I didn’t look upon it as a race, but as a last long run. Bizarrely unlike most people I read about, I love the long runs in my marathon training – all on my own, carrying my stuff, really feeling like I’m travelling around where I live. I took this attitude into last Sunday with me, and it did me proud. I had some lucky breaks, like finding 2 Portaloos with no queue just when I needed them, at mile 3 and mile 17-ish. Also you know that moment when you’ve just taken a gel and your mouth is really sticky and you really really need some water but you had wrongly guessed where the next water station was? Well, imagine at just that point hearing your name called, and seeing a friend offering you some water (Thanks Nat!). Headphones = no smiles. Me – lots of smiles! I had considered taking my ipod along for the tough bits where I had anticipated little support (between the two cities, including the two big hills). I was glad I abandoned this idea, because the support was amazing. Plenty of people around me were listening to stuff, which was really annoying when I was talking to them, only to be ignored. I was running at one point in Bristol next to a man who was wearing a running top emblazoned with the Welsh dragon. A spectator started loudly singing the Welsh national anthem at him – but as the Welshman had earphones in he completely missed it. What a waste. I, on the other hand, stayed completely in the present listening to the cheers and applause, and enjoying reading people’s banners. My particular favourite was held by a bored looking teenager and read “IT WASN’T EASY GETTING UP EARLY TO MAKE THIS BANNER, EITHER”. Smiling AND Jazz hands. What was IN that gel? The route was flat and hilly. The first half was mostly pancake-like, with everyone I spoke to anxious about the second half. I was mentally prepared to walk up the hills if I needed to (I was expecting to if I’m honest) but in the spirit of just taking everything as it came when I actually got to the hills I felt fine and just carried on running. All the way around I could see the flags of the 5 hour pacers just ahead of me. This was perfect as my ‘Gold medal’ goal was to finish in 5:15 (which means averaging around 12 minute miles) and if I kept them in sight I knew I was on track without having to keep on looking at my Garmin. My ‘Silver medal’ was to beat my Brighton time of 5:25, and ‘Bronze’ was to finish with a smile on my face. With the prospect of the hilly second half I told my family I expected to take around 5:30, so they could plan getting into Bath without having to hang around for too long. As we hit the long Kelston Hill at mile 20 I slowed to a walk to pull out my sports beans (not a euphemism) and then ploughed on up the hill slowly running and chewing. I tried visualising the hill as actually going down rather than up to see if it helped. Actually it did – don’t know what was in those sports beans! I could see the now much smaller group of people with the 5 hour pacers were walking up the hill. I gradually caught up with them until we all reached the top of the hill and we started running together. For the first time there were the most amazing views of Bath from the top of the hill. We could see it! It was only about 4 miles from here. I overtook the 5 hour group and caught up with a couple of Run Mummy Run friends who had been run-walking from the start. At the next hill I left them behind as they walked and I ran. I smiled, and ran, and smiled, and ran a bit more, and realised I was actually feeling sad that this amazing run was coming to an end. The downhills were sore on my right knee by now but I was excited to be back in Bath. Running down streets I usually go shopping along was an amazing experience, as was seeing the bemused foreign tourists taking photos of exhausted runners against the backdrop of Bath Abbey. The sneaky hill just before we entered Victoria Park was cruel, but seeing the mile 26 marker was enough to make my throat tighten with emotion “Don’t cry yet!” I sternly told myself. A glance at my Garmin told me I was definitely on for an amazing time, which made a sob rise inside me again. “DON’T CRY YET!! 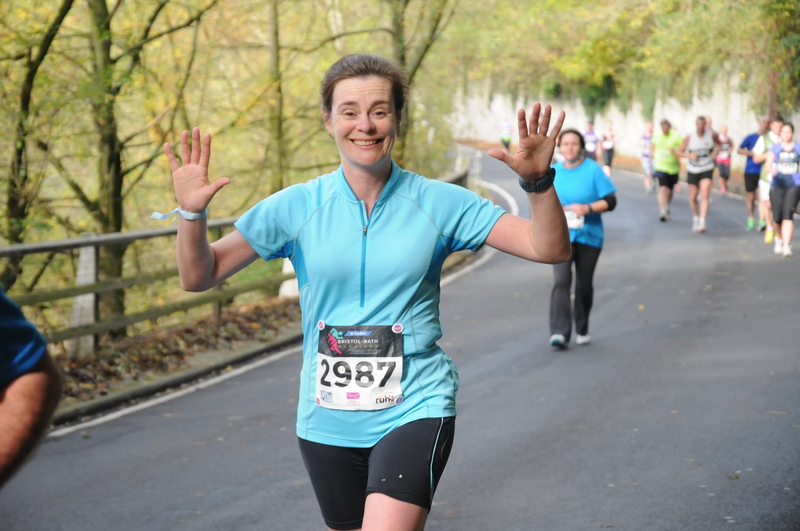 !” Into the park, crowds of people lining the barriers, spotting the finish line ahead, “Still don’t cry”, suddenly hearing “LUUUUUCCCCYYYY!”, turning and seeing my daughter waving frantically at me. She was the only member of my family who had made it to the finish before I did, despite initially not being able to find the park on the way from work. Amazing! As the sobs threatened to escape, I roared over the finish line, for the first time ever feeling justified in raising my arms to the sky. My official photos of this moment might not be pretty, but they’re the ones that best tell the story of this run. Thankfully my daughter took a slightly less deranged photo. Fabulous. I beat even my Gold medal target, so I guess I won Platinum. I finally felt like I’d run the marathon I should have been capable of for a long time. Nothing else to say, just more smiling. 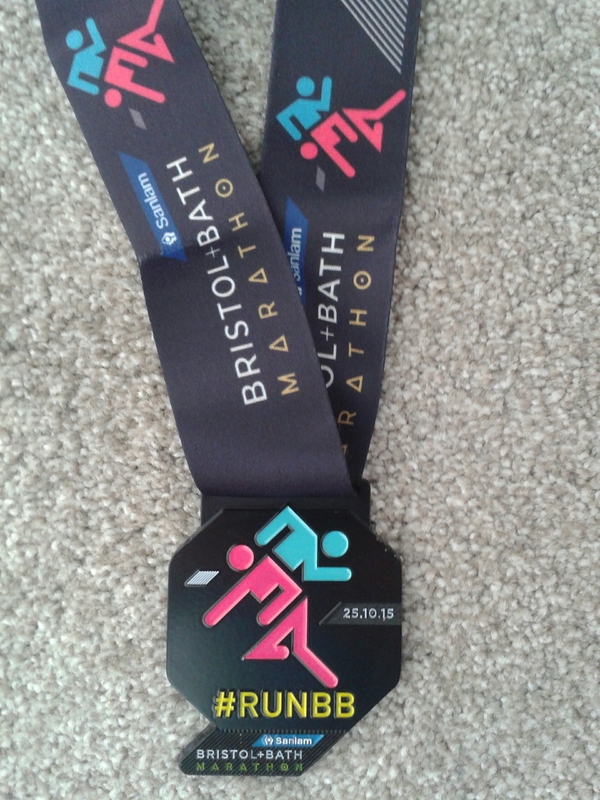 So yesterday was my third marathon – the Bristol to Bath. Just some quick thoughts on what was a fantastic day. My first marathon I ran in 2012 after missing 5 weeks of training through injury and with a longest run of 14 miles. I finished in a time of 6:07. My second was run in 2013 after great training, but I never really felt right in the race. I had a huge wobble at mile 14, another at mile 17, really struggled after that but was pleased to finish in 5:25. Yesterday’s was a strange one. I couldn’t really get psyched up for it beforehand, so I decided to think of it as just another long training run. It was a training run with people applauding me and telling me how well I was doing. What an ego boost! I can honestly say I enjoyed every minute of it, even the hills and after overtaking the 5 hour pacers I finished in 4:56:54. This is 29 minutes faster than my time at Brighton. Amazing! 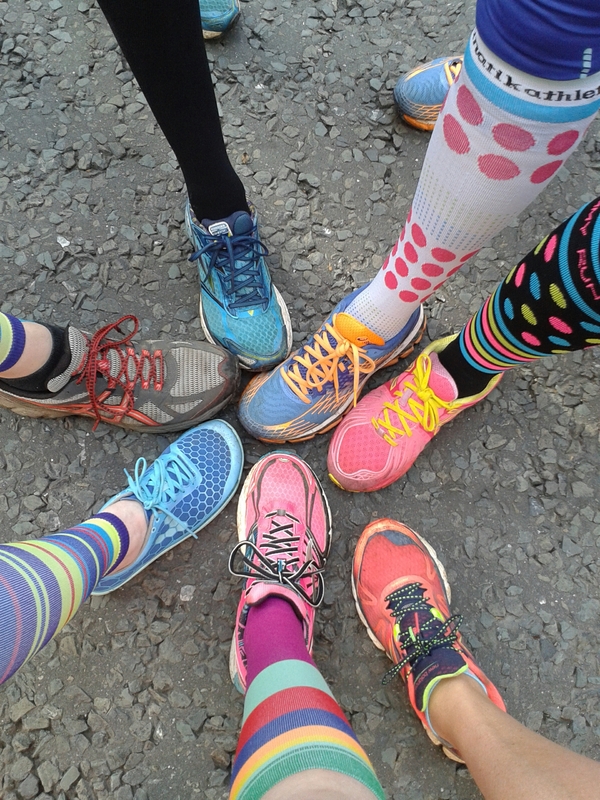 It was fantastic to meet so many lovely ladies from the Run Mummy Run group before and during the race, but I mostly ran on my own and just enjoyed the route and the sights. I’ll post more when I’ve digested it all and found some more photos. It’s the day before the Bristol to Bath marathon. I’m trying to rest as much as possible (hello sofa! ), whilst carb loading (hello flapjacks) and hydrating (hello little girls’ room). I know what I need to take tomorrow, I have a lift to Bristol arranged, I have my refuelling plans made and I have my race day outfit sorted. So why don’t I feel ready for the race tomorrow? This isn’t my first marathon – it’s my third. 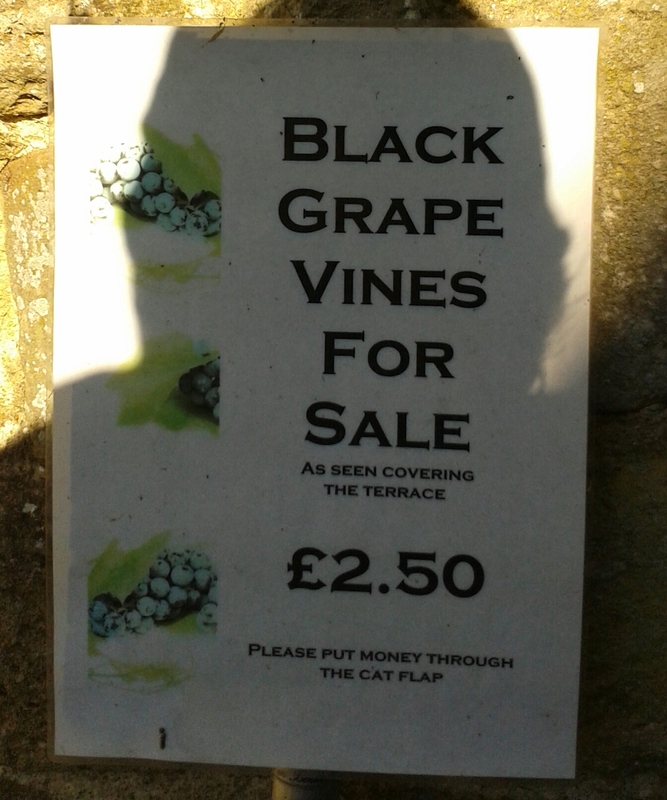 Has the novelty worn off? No – I still get ridiculously nervous before any race, no amount of familiarity seems to change that. My taper was less of a gentle reduction in mileage and more of an abrupt brake to zero, but I’m not too worried about that either: I’m rested and injury free. My previous marathons have been away from home, involving a hotel stay, a restaurant pre race meal and complicated family arrangements. Tomorrow I will have slept in my own bed. I will have eaten a home cooked meal. I will have had my usual porridge and favourite cup of tea. It feels more like preparation for a final long run than a race. I have realised though, that that’s okay. 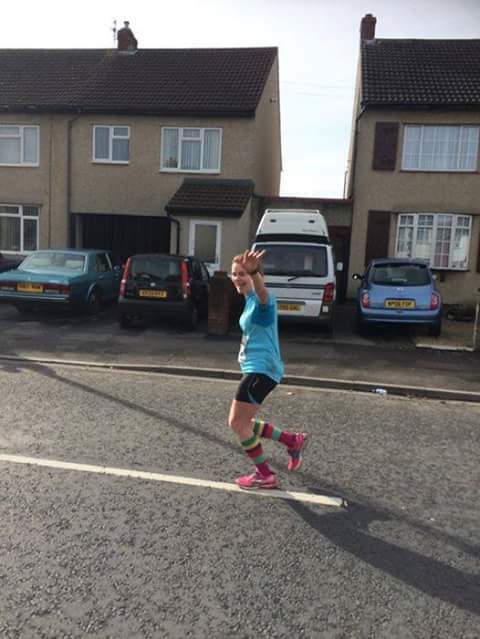 My long runs have all gone well in training – no pressure, no hassle, just a long way to run. I suspect the hard middle miles of tomorrow won’t have roads lined with applauding spectators so like my training runs I can just concentrate on running rather than high 5-ing or waving. I’m even considering taking my ipod for some podcasts. Too relaxed an attitude? I’ll find out tomorrow. Maranoia, otherwise known as taper madness, has been in full swing this week at Black and Tabby Towers. From my tapering injury, to sniffles after seeing a friend who was full of a cold, via aching legs after a day’s trial at a new job, the route to full blown Maranoia has been clearly sign posted this week. 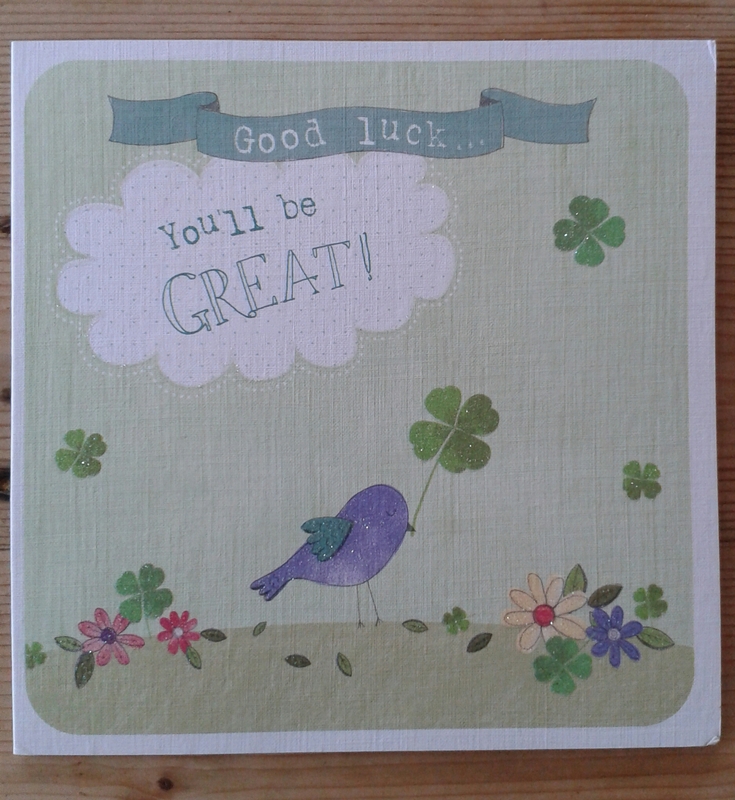 It can only mean one thing – IT’S NEARLY MARATHON DAY!!! (Three days time, actually). The key thing about Maranoia, though, is that usually nothing is actually wrong with the sufferer that just getting on and running the damn marathon won’t cure. This week saw the last long run on my homemade training schedule. I ran 21 miles last week, so thought I’d better run at least this far this week. I also wanted to run a new route, just to give myself a change. 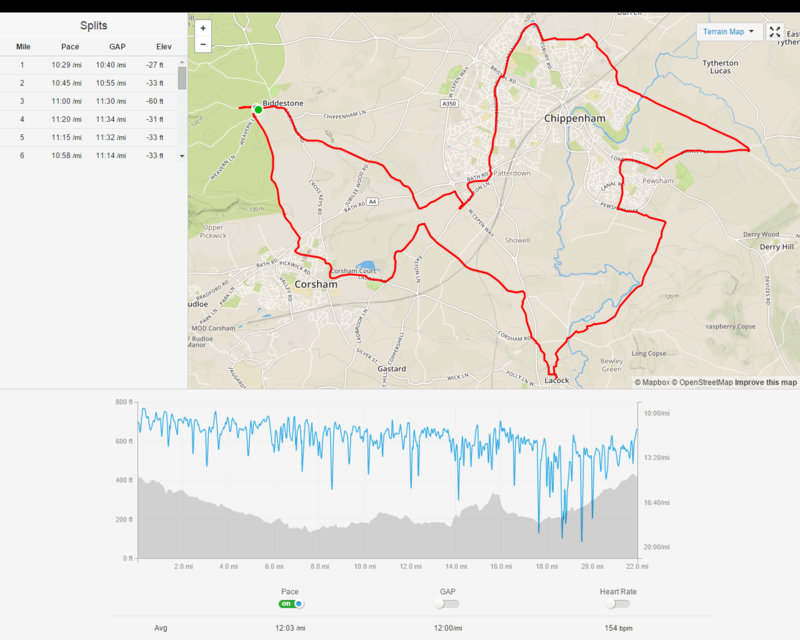 After much plotting on an online route mapping website, I stitched together a route of 21 miles that included many bits I’ve run before and a few new streets. I even printed myself off a map and a basic list of directions in case I forgot where I was going. It was a good route. I ran on little country lanes and along main roads, by the side of the canal and up a by-way, past a filming location for the next day* and one that was already set up** as I trotted through. It was hard, it took me a long time, but it was surprisingly okay. The sun came out, so it was warmer than last week but I had plenty of water and fuel with me. Actually I did wonder if I should have had more fuel, as I only ate two gels and half a sandwich thin over these 22 miles. One to ponder. I was very pleased that I managed to create this amazing route which didn’t overlap itself at all, until I got home and realised I was just 0.4 miles off a massive 22 miles so (of course) I had to run up the lane and back down just to round it up. What do you think of that, Spice Girls – “When (twenty) one becomes twenty (two)” is much better than your version. An upsetting recurring theme to this run was dead animals. I seemed to regularly pass corpses – squirrels, a rat, a pancake-flat hedgehog and worst and smelliest of all a deer. I was nearly at the bottom of the last hill back home, on a remote footpath, when I realised I could see something on the path ahead. 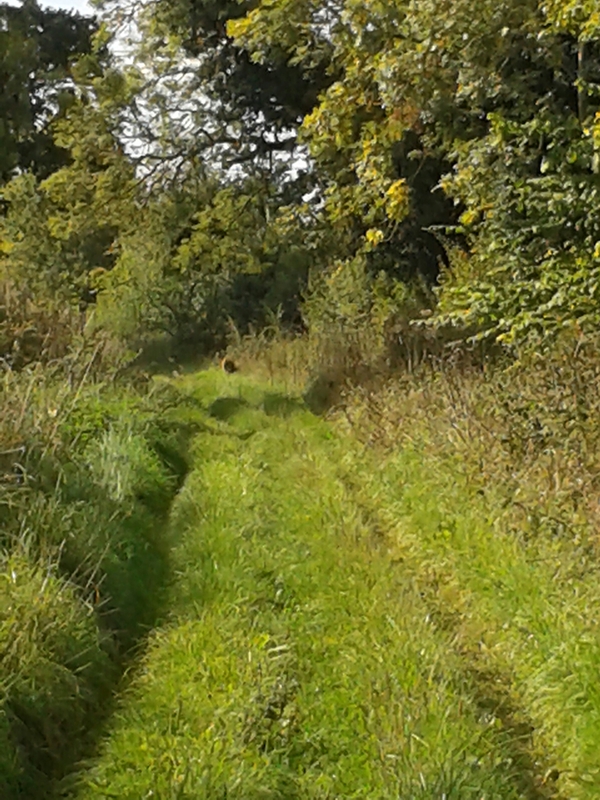 As I got closer I realised it was a deer – and it was alive! I started walking and fumbling to get my phone out to try and take a picture, and as I tried to focus my bleary eyes I realised there were actually 3 deer. Of course as I got closer they ran off, but I managed to see them again in a neighbouring field. I always say if you see a deer it makes it a special day – so to see three, on the day I ran 22 miles … wow! Did I mention I’d entered another marathon? No? 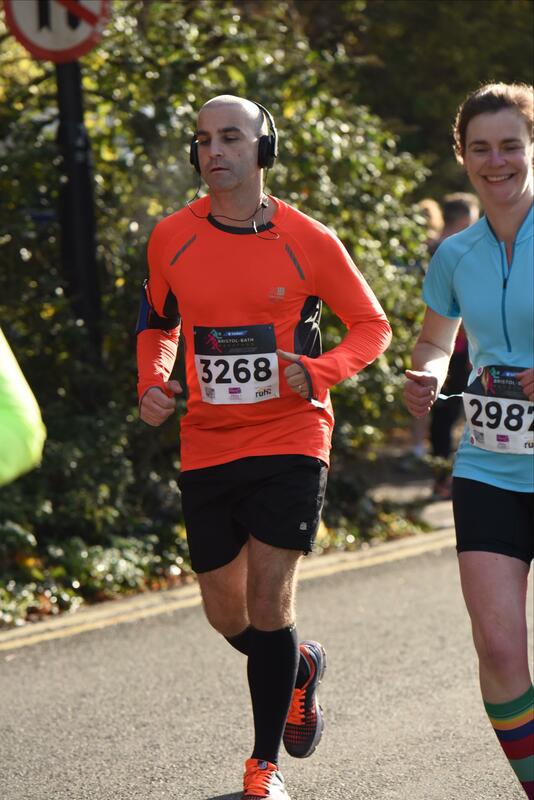 Well I’ll confess I was in denial that I was training for a marathon for quite a few weeks, despite eyeing up the race and discovering several of my running buddies had already entered. My first marathon in 2012 was run after missing 5 weeks of training due to injury, and after a longest run/walk of just 14 miles. 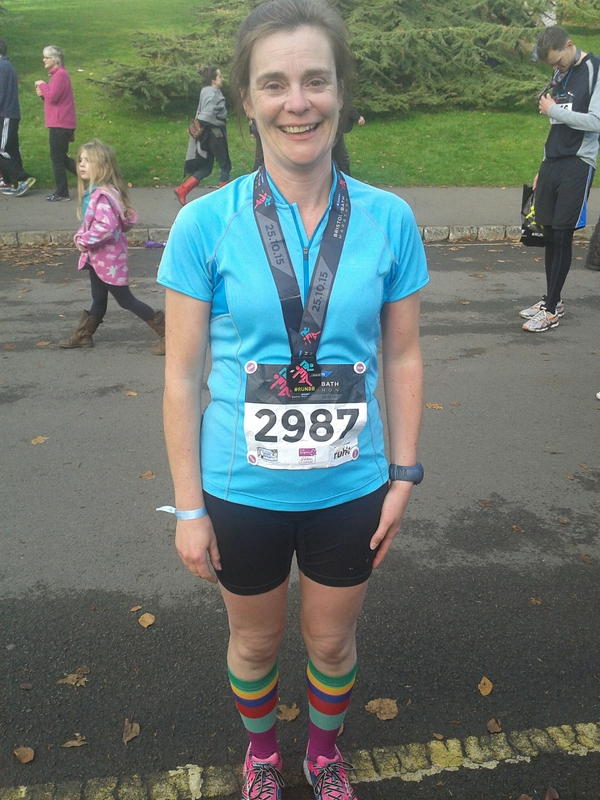 In 2013 I ran my second, after proving to myself I could complete the training. 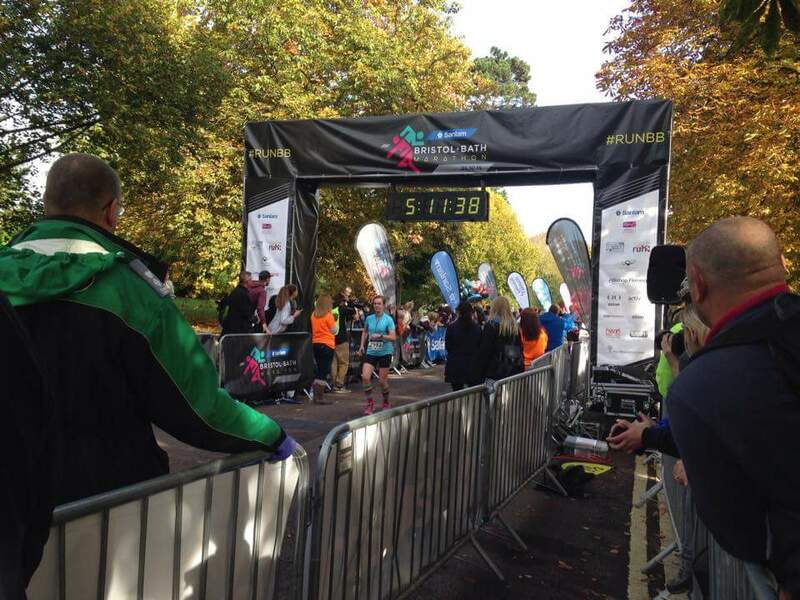 Although I completed this marathon over 40 minutes quicker than my first, I had a couple of ropey moments. Apart from the miraculous toilets and someone playing “Jump Around” when it was all I could manage to continue shuffling, I have always had the feeling that I still haven’t given the marathon distance my best shot. Hearing about a brand new race, very local to me, was too tempting to ignore. Without an official training plan I started upping my miles, keen to see how I felt before committing myself. It was only when I’d comfortably run 14 miles that I stumped up the cash and entered. 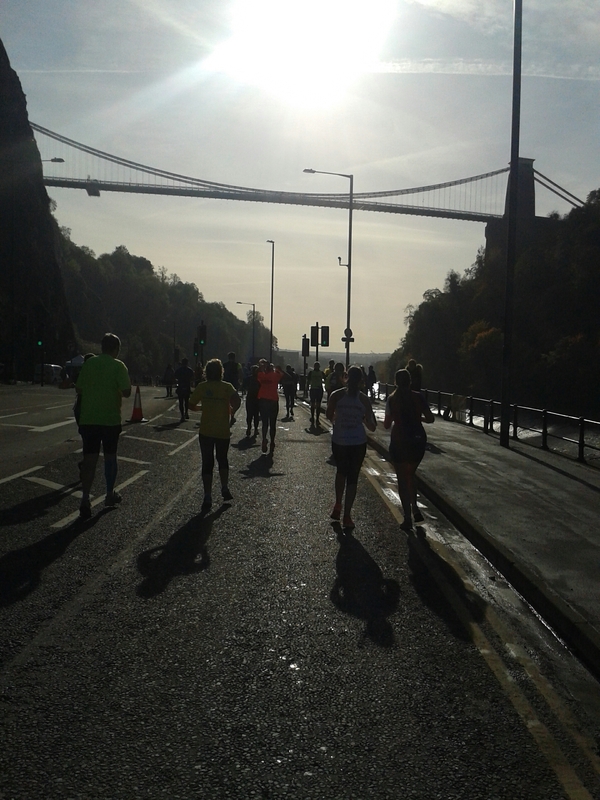 The inaugural Bristol to Bath Marathon is going to be held on 25th October, starting in Bristol (not surprisingly), running around the streets of Bristol for nearly a half marathon before finally heading out to Bath via a couple of horrible hills. I am already planning on walking up both of these inclines (it’s 26.2 miles -who needs hills as well?? ), and I really must have a recce of them beforehand just so I know what I’m dealing with.